Seems like only yesterday I was writing a similar post last year! A year on and the bike is getting closer to what we want it to be, must be time for a new one! 2500km in the last year, may well have been 3000 except for the bad batteries and the sore neck! 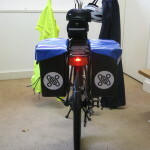 The new rear lights arrived, and looks good, works well, and certainly increase my confidence in being seen at dusk in the traffic. 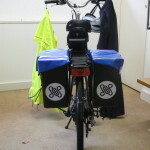 As well as the new lights looking very much like a part of the bike, you can also see the SOS roundels in the pannier body, which are cut out of white 3M reflective vinyl (there are matching roundels on the front of the panniers too). There are reflective strips on the controller bag under the seat, and the yellow jacket in the photo lights up like a christmas tree in car headlights too! 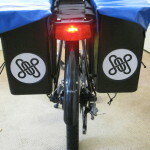 Add the reflective trouser clips and pedal reflectors into the mix, and I will be difficult to overlook at night! At the front, a Cateye Volt 300 lights the way.